Bio-rhythms are critical to our routines from sleeping, awaking, working, and hunger. All are energy related, therefore it stands to reason that both nutrient and quality caloric intake may contribute to ones ability to fall asleep and stay asleep. Consider your dietary intake before taking sleep medication; by making a few nutritional and routine changes you may find that you are able to take control of your night’s rest. Relax, let go of your day. 32% of the population actually meet the Dietary Reference Intake (DRI) of magnesium. Without it the body is unable regulate sleep, its deficiency leads to asthma, depression, diabetes, insomnia, and osteoporosis. It can reduce the severity of symptoms related to: fibromyalgia, migraines, heart attack, premenstrual syndrome, stroke. “Magnesium is required for the active transport of ions like potassium and calcium across cell membranes. Through its role in ion transport systems, magnesium affects the conduction of nerve impulses, muscle contraction, and normal heart rhythm”, stated by the Micronutrient Information Center at Linus Pauling Institute at Oregon State University. By including a variety of foods it easy to obtain the necessary amounts of magnesium needed for one to fall asleep. Consume: dark leafy greens (spinach 1 cup raw 24 mg vs. 1 cup cooked 157 mg), pumpkin or sesame seeds (1 oz 150 mg), brazil nuts (1 oz/28 g 125 mg), almonds (1 oz/28g 93 mg), avocado (1 chopped 58mg), beans/lentils (1 cup cooked 148 mg), Mackerel fish (3 oz/85g 82mg). Zinc Inhibits Magnesium. While it stands to reason that certain medications can interfere with proper magnesium absorption (discuss with Doctor), a study conducted on men, and another study on adolescent boys showed that the mineral zinc decreases the body’s absorption of magnesium. However increased amounts of protein (3 ozs/90g) promote magnesium absorption. The body needs zinc for cell/energy metabolism, growth, development, cell signaling systems, immune system, neurological development, reproduction. Found in all body tissues zinc is important for enzyme and hormone function, vision, taste, smell, and in wound-healing. Depletion of zinc & magnesium can come from consuming high amounts of coffee and tea. Stay Asleep with potassium. Potassium is an electrolyte that promotes fluid balance within the body, ridding excess sodium, aiding in cellular growth, and muscle contractions. It is found in most fruits and vegetables containing Vitamin C making it readily available and can be included at almost every meal. Eat: grapefruit, berries, oranges, bananas, kiwi, avocado, melon papaya, corn, and potato. Men and Women (DRI) 4,700 mg/day. Wake up Rested. Include foods with Vitamin B6 and the protein Tryptophan. Vitamin B6 helps create serotonin from the protein Tryptophan. Serotonin is neurotransmitter that is linked with happiness. In simplified terms, a Neurotransmitter (serotonin for example), is like the super-autostrada of information in your brain that allows different parts to talk to each other. Tryptophan is converted to serotonin while one sleeps. At dinner time find health and comfort by including variety of foods: eggs, oats, bananas, poultry, meat, whole grain pasta, fennel or sunflower seeds, figs, fish, peanuts, milk, cottage cheese, and 1 ounce chocolate. Exercise is equally important to de-stress the body, provide oxygen to the muscles, excite, create neurons, and promote relaxation. 30-60 minutes a day, 4-5 times a week will keep your body and brain energized and strengthened. Foods that should be avoided are: fried, fatty in taste, salty, sugary, artificial sweeteners, and caffeine 6 hours before bedtime. A sample menu has been put together to present an idea of what your dietary intake should look like in order to stabilize your bio-rythym and have a more restful night. “Magnesium”. Ods.od.nih.gov. 2009-07-13. Retrieved 2011-11-04. Wurtman RJ, Wurtman JJ, Regan MM, McDermott JM, Tsay RH, Breu JJ (2003).“Effects of normal meals rich in carbohydrates or proteins on plasma tryptophan and tyrosine ratios”. Am. J. Clin. Nutr. 77 (1): 128–32. PMID 12499331. Magnesium function. Rude RK, Shils ME. Magnesium. In: Shils ME, Shike M, Ross AC, Caballero B, Cousins RJ, eds. Modern Nutrition in Health and Disease. 10th ed. Baltimore: Lippincott Williams & Wilkins; 2006:223-247. The Integrity of the Immune System is critical to ones overall health. Zinc is a key mineral to assisting the function of the immune system. Found in a variety of protein based foods (meats and oysters), mushrooms, onions, garlic, orange vegetables, and orange fruits are rich in vitamin A and Zinc. Mushrooms cause the immune system to work more aggressively and should be included in a weekly dietary intake. The following recipe can be served with beef, pork, or poultry. The meats may be filleted and layered with the puree, or roasted with the vegetables and herbs on the side. Make a cut length wise on pork at about 1/2 in from top. 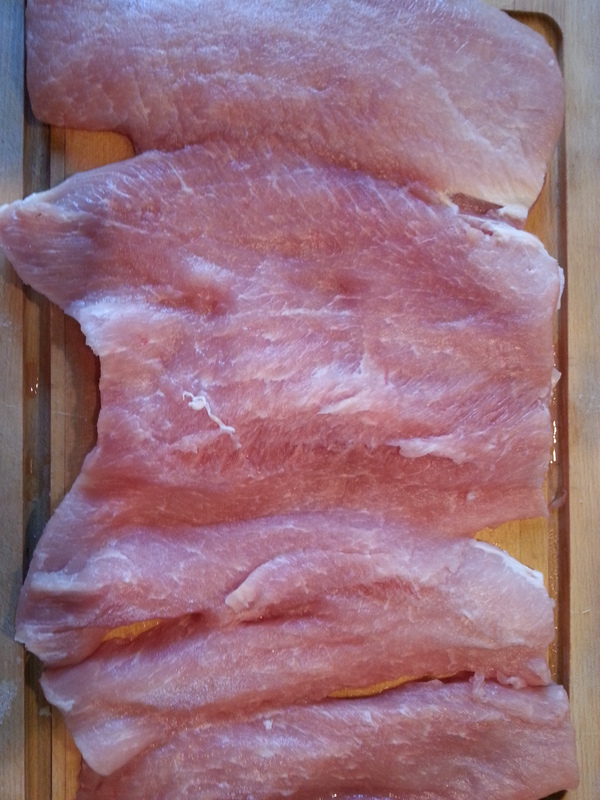 Continue to unroll meat with each length wise cut. 3 pound pork carefully filleted to extend the span of 18 inches. In a blender puree: sausage, mushrooms, garlic, parsley, thyme, salt, olive oil and soy sauce for about 20 seconds. While lacing the meat to secure the meat is typically done, consider cutting 5 cutting strings at about 9 inches in length to utilize for encircling the meat and tying in knots. 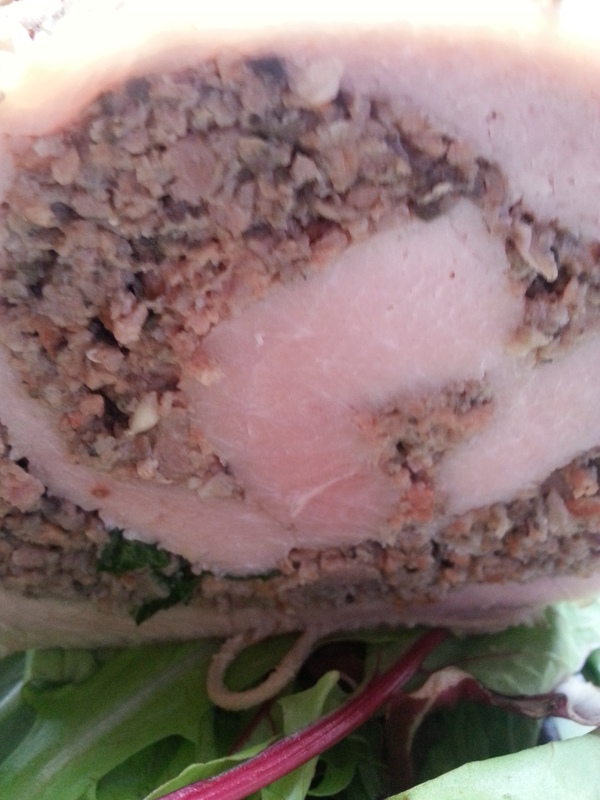 Place puree into center of meat and roll the fillet. Encircle string around pork every 1-2 inches and tie a knot or lace the string. With a spoon layer the puree mixture onto the center of the pork. Carefully begin to roll meat and pull inward as to tighten the meat roll. Either lace the meat or slide a string under the meat, encircle it and tie a knot, each knot will be about 1-2 inches apart. Sear meat on stove top, turn on heat to high, place pan on burner. Wait for 1 minute. Add butter, once melted add meat roll and place meat in pan. Allow to brown on all 4 sides, about 2-3 minutes per side. Turn off heat and remove skillet from burner. Place meat into a roasting pan add fluid. Cover with aluminum foil and allow to bake for 20 minutes per pound. Remove from oven and allow to sit for 10 minutes, place on a grooved cutting board and thinly slice the meat. May be served with roasted potatoes and saute asparagus. In medium size sauce pan, fill half way with water. Add cubed potatoes and allow to lightly boil for 15 minutes. Remove from heat. Drain from water. 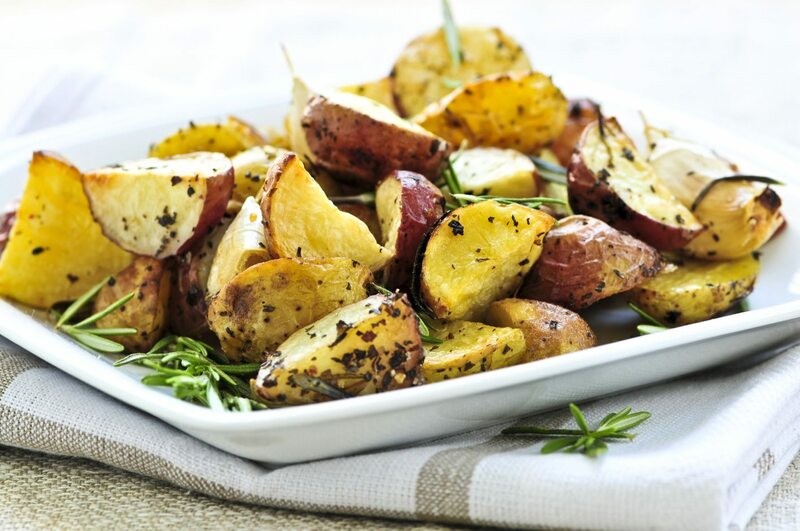 In a baking dish, place potatoes, 1/8 cup olive oil, 1 teaspoon salt, and freshly chopped rosemary. Stir together. Bake in oven for 20-30 minutes on 400 F.
Roasted Parmesan Fennel Bulb. Excellent with Pork. Perfect as a vegetable to assist in digestion. In a medium size sauce pan fill half way with water. Add fennel to water and place on high temperature to boil for 15 minutes. Remove from heat, drain water. Place in baking dish, add 1/8 cup olive oil to pan, add cooked fennel, 1/2 tsp salt, scatter bread crumbs and parmesan cheese on top and drizzle 1/8 cup olive oil on top of vegetables. 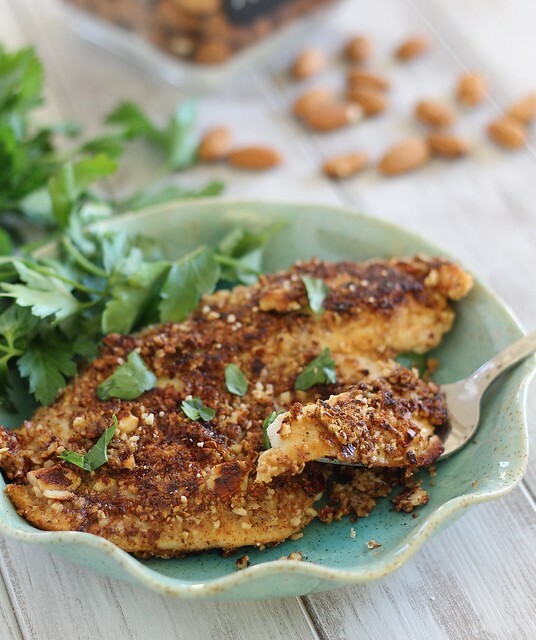 Place into oven and allow to bake for 20 minutes on 400 F.
Improve on the dietary benefits by adding almonds to talapia fish! Talapia is an easy fish to prepare, but carries lower amounts of nutrients compared to other fish. Adding a handful of crushed nuts to coat the fish, boosts the health of the heart and blood pressure by more than tripling the amounts of: omega oils, vitamin E, magnesium, phosphorous and potassium. The dinner is easy to prepare and in less in than twenty minutes is ready to serve! In a large pan add 4 cups of water and rice, bring to a boil, reduce to low heat and cover allow to boil for 14 minutes. While the rice is boiling, begin to coat the talapia fillets with bread crumbs and place in a baking dish one at a time. Sprinkle with salt. Scatter almonds over all the fillets. Top off by placing lemon zest onto each fillet. Drizzle olive oil over the fish. Place into oven and allow to bake for 12 minutes. Place sauce pan on medium heat, add soy sauce and sesame seeds. Bring to a simmer for 3 minutes and turn off heat. Cover with lid. In a frying pan, warm oil over medium heat for 1 minute. Add garlic and spinach to pan. With 2 spoons or tongs begin to toss the spinach in pan for 30 seconds. Turn off heat remove pan from heat and cover pan with a lid to seal heat; spinach will continue to slightly wilt. Place rice onto dish. Pour soy sauce over rice. Next, layer spinach onto bed of rice. Lastly, place baked almond talapia on spinach! Enjoy!!! Saute` Kale topped off with parmesan cheese and pine nuts. 3 Cheers for Cruciferous Vegetables! They are proving to be an added health factor in dietary intake. Exciting studies link the kale power house to inhibiting tumor growth “at the top of the cancer-related research for colon cancer and breast cancer, but risk of bladder cancer, prostate cancer, and ovarian cancer have all been found to decrease in relationship to routine intake of kale.” While all of this is promising, it is also important to note that some digestive tracks can be more sensitive to the the large amount of Vitamin K and fiber that is present, and therefore is linked to diarrhea as a side effect of kale. “For your eyes: Kale is high in lutein and zeaxanthin, phytochemicals found in the retina, which could help reduce the risk of macular degeneration, the leading cause of blindness in older people. The American Macular Degeneration Foundation says research has indicated that eating red, orange, yellow and dark green fruits and vegetables, which are high in phytochemicals, seems to have a protective effect against vision loss. For your immune system: Kale is rich in beta-carotene (vitamin A), a powerful antioxidant that may help boost the immune system and possibly protect against some chronic diseases and cancer. At least one study also found that long-term consumption of beta-carotene had cognitive benefits. For your bones: Kale is is one of the few vegetables with a decent amount of calcium, but it’s especially high inmagnesium — just a cup contains 40 percent of the RDA — which is very important for bone health and to protect against osteoporosis. Magnesium has a crucial job working with vitamin D to help your bones absorb calcium. In addition, research has shown that the vitamin K in kale also contributes to bone health by improving bone density. Kale maybe substituted for a variety of spinach dishes. Steamed and sautéed are the optimal way to maximize the nutrients within kale and let it work for your body. However, it can be boiled and then seasoned with olive oil, salt and pepper and served on the side. Green or Cruciferous Vegetables of all types are a key source of specialized chemical signals that our immune systems use to self-communicate. Four servings of cruciferous foods throughout the week will enrich the overall health of your body and promotes a sound mind. Saute` onion and garlic in olive oil for 5 minutes. onion to turn translucent, about 5 minutes. Meanwhile, wash kale leaves and remove access water. Cut leaves into bite size pieces. (May remove or keep center stem.) Add kale to frying pan, rotate leaves, combining with oil until well coated, add salt, reduce temperature to medium low, add water. Cover and allow to cook for 5 minutes. Serve on side of meal by itself or with parmesan cheese and pine nuts. Indole-3-carbinol inhibits the expression of cyclin-dependent kinase-6 and induces a G1 cell cycle arrest of humanbreast cancer cells independent of estrogen receptor signaling. http://www.ncbi.nlm.nih.gov/pubmed/9461564 “A component of cruciferous foods inhibits growth of mammary tumors”. Banerjee S, Wang Z, Kong D, et al. 3,3′-Diindolylmethane enhances chemosensitivity of multiple chemotherapeutic agents in pancreatic cancer. 3,3′-Diindolylmethane enhances chemosensitivity of multiple chemotherapeutic agents in pancreatic cancer. 2009.